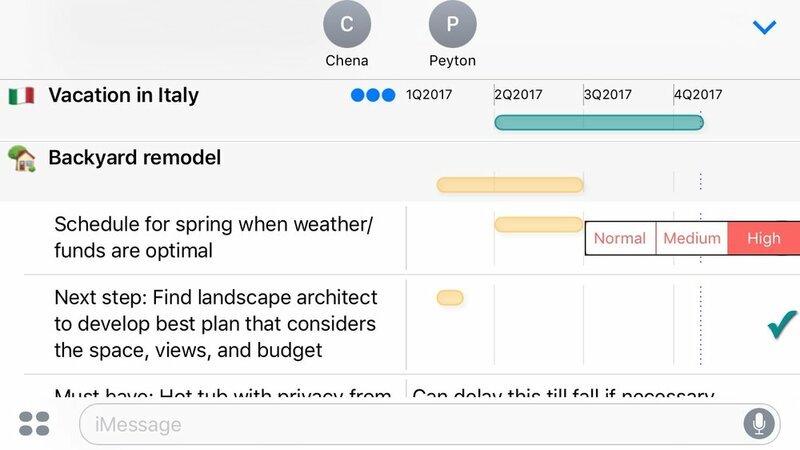 Wicked Buckets brings easy collaborative planning to the rest of us. And part of its magic is that it does this with the people you’re texting while you’re texting, with no new accounts or passwords, and no subscriptions. Wicked Buckets is fully collaborative. Everyone in the group can edit the buckets at any time, and all will be notified of changes and see the updates live. 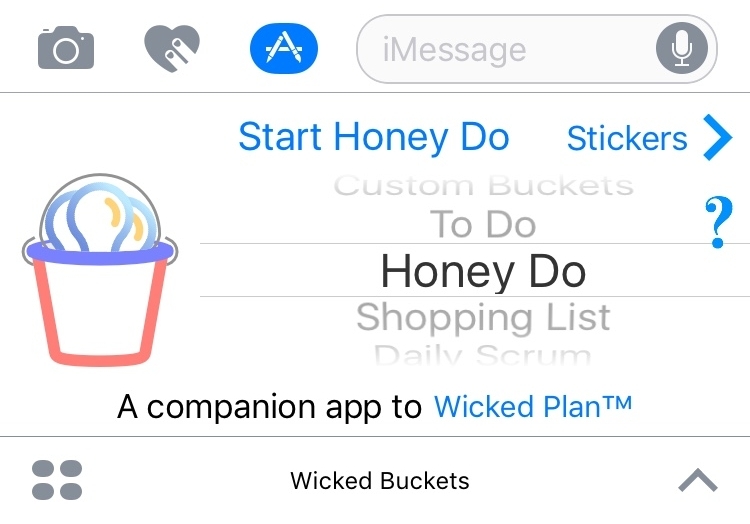 If you’re married or in a relationship and want a shared honey-do list to eliminate conflict over family chores and who’s doing what by when, or a shared family grocery list to know who’s shopping for what when, Wicked Buckets is for you. If you’re planning an event with an organization for which you volunteer, Wicked Buckets gives you and the whole team a place to collaborate on the information you need for the event plan. 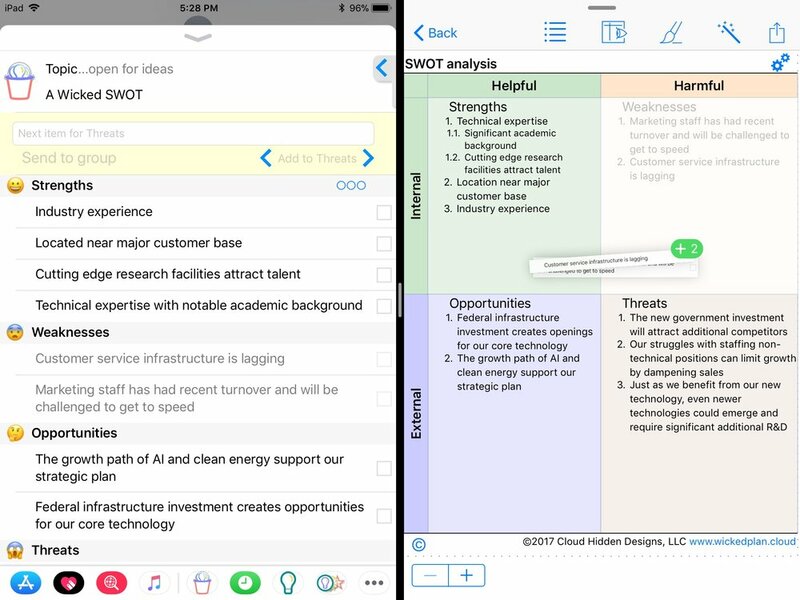 If you're planning a project at work such as a product roll out, or collaborating on a SWOT analysis, for example, Wicked Buckets lets the whole team work on the project at once, with live updates and notifications. The individuals on the team can also work at any time and from any place, following the workflow that suits them. With Wicked Buckets, you gather your ideas and tasks and separate them into buckets (categories) with your spouse, amongst a group of friends, or with your work team, all while you chat in Messages. Wicked Buckets includes more than a dozen pre-built templates of popular planning models, including a honey-do list, shopping list, SWOT analysis, Eisenhower Matrix, and more. They let you start on your plan with zero effort. You can also create custom buckets for total control. Your family might be planning a vacation, a backyard remodel, and a relocation, for example. Or the organization for which you volunteer might be planning a fundraiser, where you'll want buckets for volunteers, publicity, event activities, and more. Tap the Start button after deciding the type of bucket list to create. When using custom buckets, you can add to, edit, or delete those buckets at any time. Use the standard controls for these actions. You can also change the icon that appears to the left of the bucket title and the word used to describe the current bucket. To change the icon, add an emoji to the text, such as the flag of Italy for the trip bucket. Select the text (the emoji) and you'll see a menu that includes the item Wicked Grab. Tap that item and follow the directions that appear. You can then delete the emoji from the bucket title. It's an easy way to customize the look of your custom buckets. 1. Tap the < or the > button until the desired bucket appears between the < and >. The short text describing that bucket can be customized with the Wicked Grab feature described above. 2. Scroll to the bucket that's your target and tap once in the left margin of any of its items. Wicked Buckets will scroll back to the text box and make that bucket the new default. When you've typed a new item, either tap the button that appears between the < and > or press the return key. The item will be added as the top entry for that bucket and the text box will be cleared for the typing of your next item. Wicked Buckets can be used by yourself or with a group you're messaging. To send the data to the group (or even to just yourself), tap the Send message button that appears when changes have been made. In iOS 11, the data will immediately be shared with the group and both notify them and update their displays if appropriate. This is a new iOS 11 feature called Direct Send. In iOS 10, you'll be dropped into Messages, from where you need to tap the blue Messages send button to actually transmit the data. Sending data is the only way to preserve it, as the data is part of the message and not a separate document. Tap in a cell to edit it. That's it. Tap, type, then tap somewhere else. There's a lot happening in one place, since you can tap to edit, swipe to scroll, tap in a margin to set a new default bucket, and press to use iOS 11 drag and drop. In general, tap on text to edit it, and use the left margin to swipe for scrolling and to press for drag and drop. Wicked Buckets supports a wide variety of data to help you with your planning. You can embellish each item in a bucket with notes, dates, and amounts. To view the columns of other data, tap the button with three circles. This displays a list of the columns that you can tap to toggle on and off. The button's circles will either be filled or empty to indicate that there is or is not yet data for those columns. If they are all empty, it may save you from looking for data that doesn't exist. 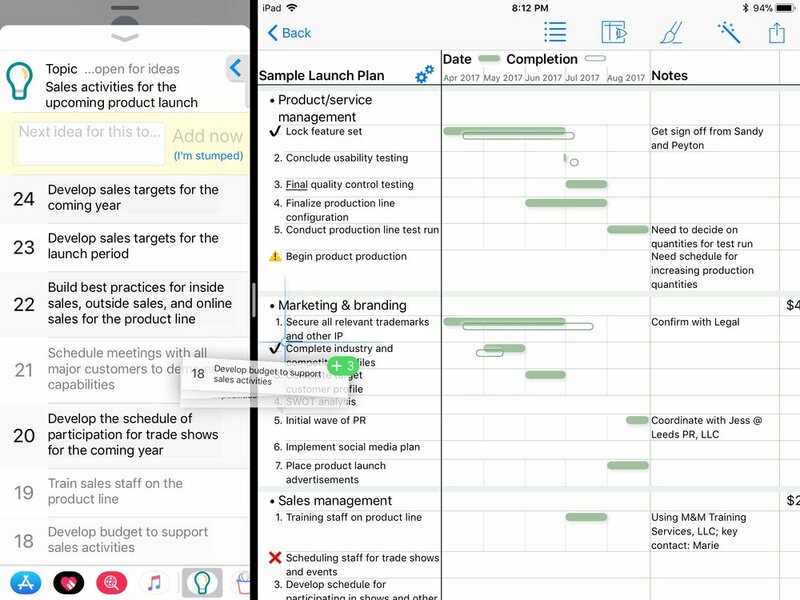 On an iPad or an iPhone in landscape, all columns will display. On an iPhone in portrait, depending on the phone size, just one column at a time may display if there's insufficient space for all of them. Dates, schedules, and deadlines are an important part of many plans, and Wicked Buckets makes it visual with no extra effort by you. Enter a date by typing it, but then Wicked Buckets will automatically configure a column axis and display that date as a time chart (a Gantt chart). You do not have to specify the date range or anything, because Wicked Buckets will determine it from your data. It's the world's easiest Gantt chart! Further, type the dates with enormous flexibility. For example, a lot of planning items don't have a precise date/time and might be approximated to a day, month, quarter or year. So if you type "Oct 16", the bar will display for all of October 16 of the current year. If you type "Q2", the bar will display for April, May, and June of the current year. To specify a range of dates, type a date, press return, and type the second date. All of the following are legitimate: 2018; Jan; Jan 2018; January; Jan 15; Jan 15, 2018; 1/15; 1/15/18; 1/15/2018; Q1; 1Q; 1Q2018; Jan 15, 2018 1:00 pm, 1/15/2018 1:00 pm. An item can be prioritized by swiping the check box to the left. The choices that slide out are Normal, Medium, High, and Nag. Medium and High display a yellow and red circle (think stoplight) respectively beneath the check box and those items are listed in the Live Layout in Messages. Nag displays a gray circle and will display as an animated marquee in the Live Layout in Messages. 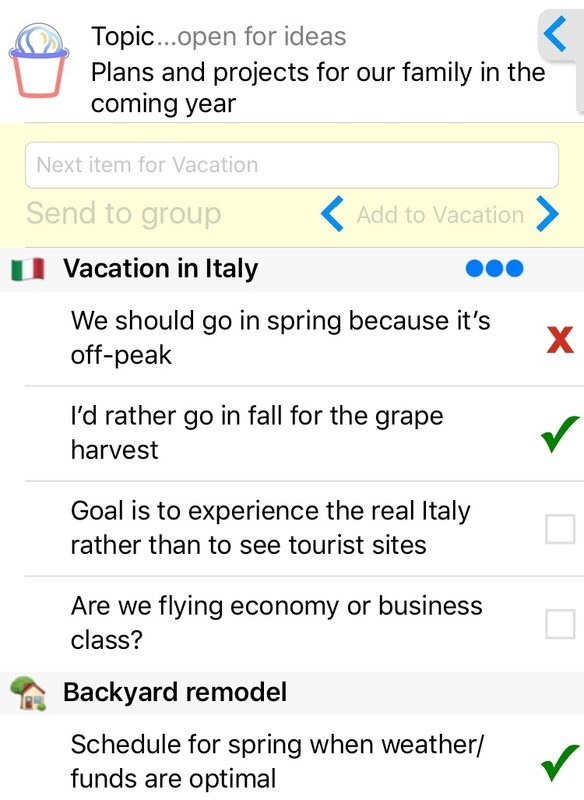 That means you can see prioritized items without even launching the app, and it's automatically updated as other group members edit the topic. iOS 11 adds drag and drop to iPads for amazing freedom to share data between apps. The easiest way to try this is to set up a split screen with Wicked Buckets on the left and a Wicked Plan document on the right. Press in the left margin of an item in Wicked Buckets and start to drag it once the item "lifts" off the screen. Then while still pressing, use another finger to tap a second, third, or more rows. They will each lift and animate to the item being dragged. Continue dragging it to the app on the right of the split screen and drop it where you please. In this way you can quickly add items from Wicked Buckets to a Wicked Plan outline or even a canvas. With the potential for many buckets with many items in each bucket, there may be times to temporarily show fewer items. Just like Wicked Plan allows rows of the outline to be expanded and collapsed, Wicked Buckets allows buckets to be expanded and collapsed. Double tap the icon to the left of a bucket's title to alternately expand and collapse the items in that bucket. The owner of a Wicked Buckets thread is the person who started it. They have special privileges, such as being able to delete and rearrange items and being able to change the buckets themselves. If there's a need or desire to change the owner to another person in the group – perhaps the owner is unavailable and an edit is important to make – double tap the image of the bucket at the top left of the screen and follow the directions. Use this feature with caution, of course, as the prior owner may not be happy about such a change. Effective collaborative planning depends on the cohesion of the team.